A lovely tree decoration to add to your collection. 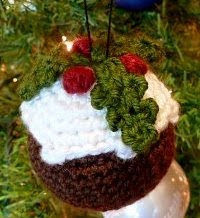 I'll definitely be making this one for our tree! Mmmm Looks good! I love your amigurumi patterns. Especially the cute little robin, "Boo", and the marshmallow. I made the marshmallow last night for my mom and I'm working on "Boo" now.